St Peters Churchyard - YouWho? 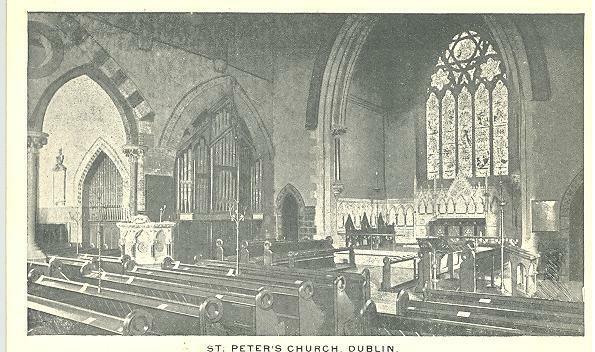 First reference found to St Peter's dates from the 13th Century. There was a drop in the parishioners in 1883 following the dismantling of civil parishes. By 1950 there was a major population decline and it closed for worship on Sunday 28th September 1975. A vault was constructed in St Peter's churchyard for the Emmet family into which Robert Emmet's mother, Elizabeth Mason, was buried. Unfortunately no contemporary reference has been found describing the vault or its exact location in the churchyard, so the mystery of where Robert Emmet is buried remains a mystery. The property was sold to the Young Men's Christian Association in 1980. The headstones are no longer an intact collection, some ( 23 is the figure mentioned) were moved to St Patrick's Cathedral, others went to St Luke's in The Coombe. The last tranche were left in the custody of the YMCA and were stored in the YMCA's cricket grounds in Sandymount but are no longer there. The council has been made aware of a sighting of some of the headstones in an architectural salvage yard. The remains of those interred seems to have been scattered all over the city. The 1980/1 exhumations were carried out with the use of a mechanical excavator and over a period of five months 1200 burials were removed from the site and re-interred at St Luke's Crypt. On remembrance Day (7th November) 2015 the war memorial from St Peter’s Church, Aungier Street, which had been restored and reassembled was placed in St Catherine and St James’s Church on Donore Avenue. The memorial details the names of those from the parish who died in the First World War and Archbishop Michael Jackson rededicated it.